Welcome to Liberty Landing Too! Natural daylight brightens the living space. Contemporary decor in historic downtown. The sofa pulls out to a Queen sleeper. Ample floor space for little ones (or pets!) to roam. The living room is open to the kitchen. 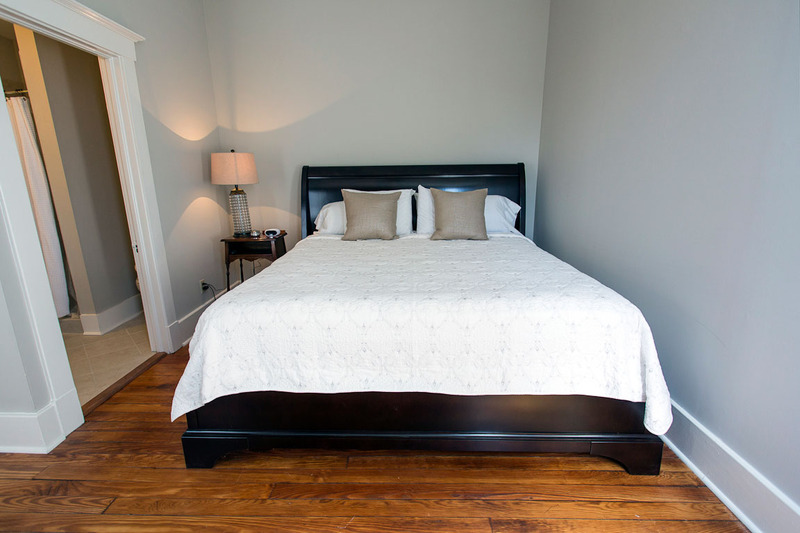 Hardwood floors are original to the building. The full kitchen is fully equipped for your cooking needs. 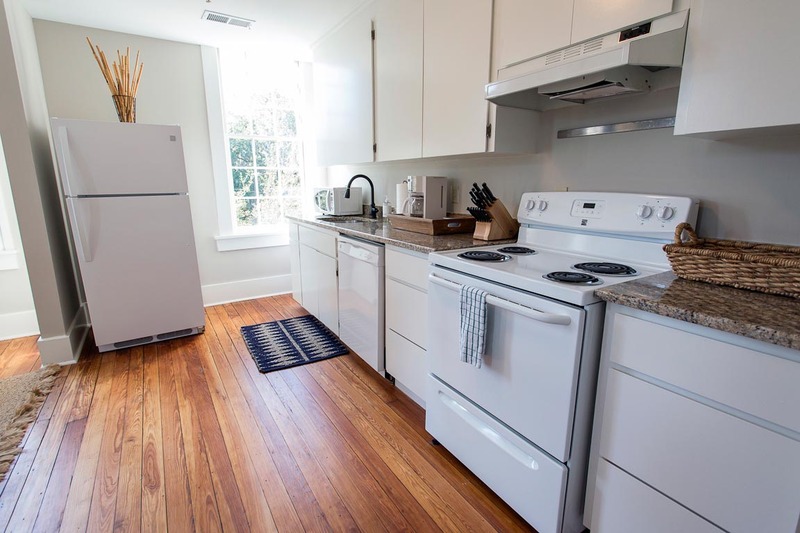 Full size fridge and stovetop are ideal for longer stays. The bedroom boasts excellent views of downtown. The fireplace - now decorative - anchors the room. Watch your favorite shows from the bed. The bath is en suite to the bedroom. 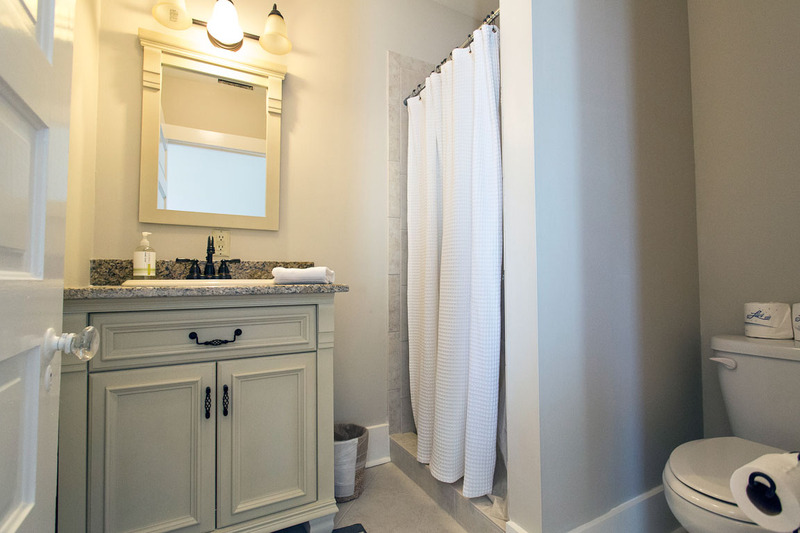 The full bath has a walk-in shower. The magic of Broughton Street at night. Savannah's deep history is well within walking distance. Stroll down Factor's Walk for Savannah's best architecture. River Street is only a short walk away. Welcome to historic downtown Savannah. 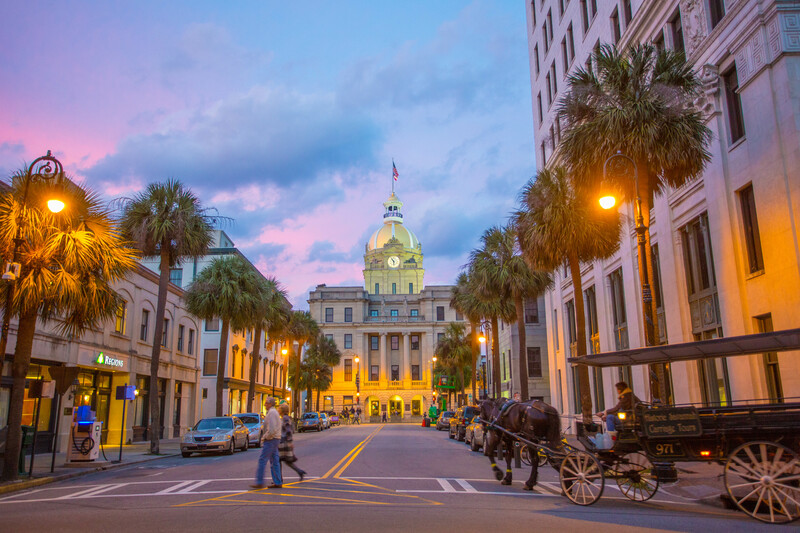 Your next Savannah vacation awaits! This third floor apartment has stunning views overlooking the Cathedral of St. John the Baptist and the oaks of Liberty Street. 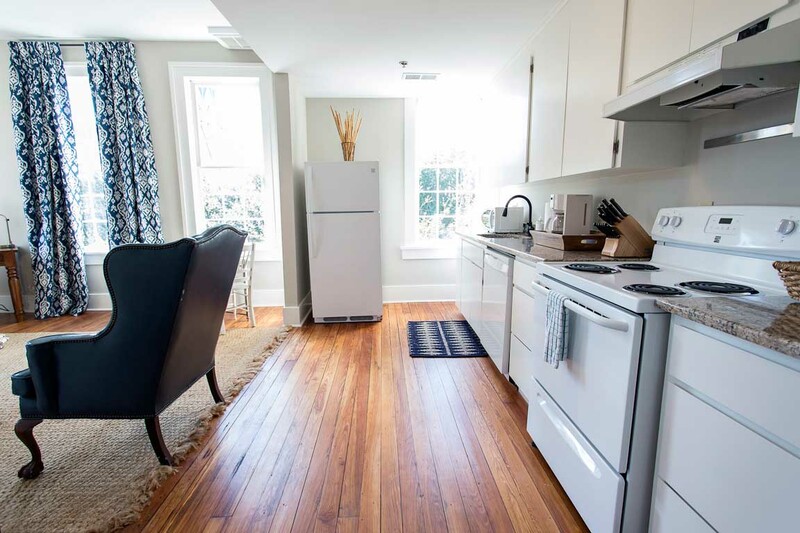 Guests love the stylish interior of this pet friendly home, and the close proximity to all Savannah has to offer. The open floor plan features hardwood floors, a decorative fireplace, and large windows that let in lots of natural light. The full kitchen has everything you’d need to enjoy a home cooked meal, and a small table next to the window is the perfect spot to have coffee and plan your day. The living room has a comfortable couch and a wall mounted TV, so you can catch up on some of your favorite shows or that movie you’ve been meaning to watch. 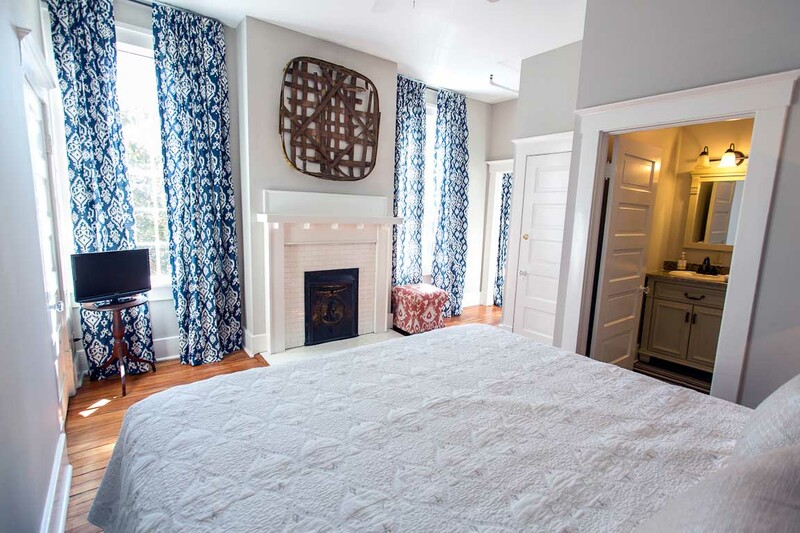 Behind the living room is the Master Bedroom, with a second decorative fireplace, king sized bed and TV. The updated en suite bath has a large vanity and walk-in tiled shower. You’ll be staying right next to J. Christopher’s, a pet friendly and popular brunch spot! After breakfast, spend some time wandering around Colonial Park Cemetery, the final resting place of many of Savannah’s earliest residents. 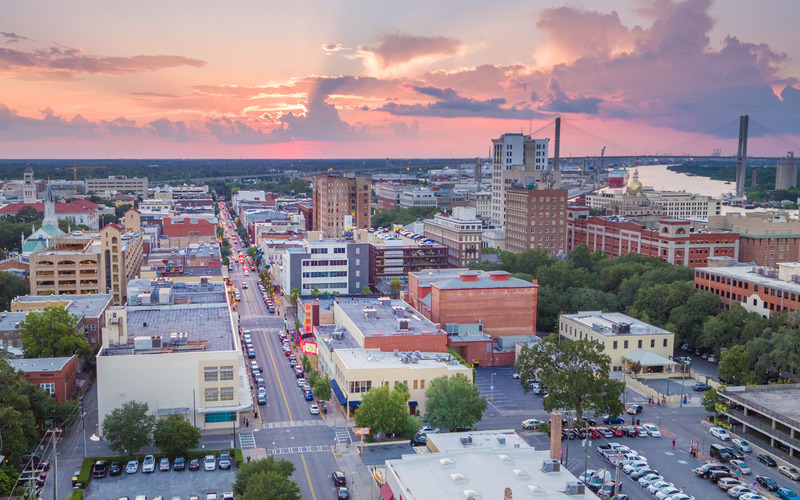 City Market and River Street, hubs of Savannah’s nightlife and entertainment, are both within an easy walking distance from this property. - This home has a washer and dryer, making it ideal for extended stays. - This home is right in the middle of the race route for The Rock ‘N’ Roll Marathon, making it a prime location for runners and spectators alike. - Parker’s Gourmet Market, known to locals as Fancy Parkers, is just around the corner and open 24hrs. We celebrate our anniversary every year by visiting Savannah (where we were married on March 17, St. Patrick's Day!) For 15 years we've enjoyed our "soul city" and Lucky Savannah rentals has made that easier for us for several years now. 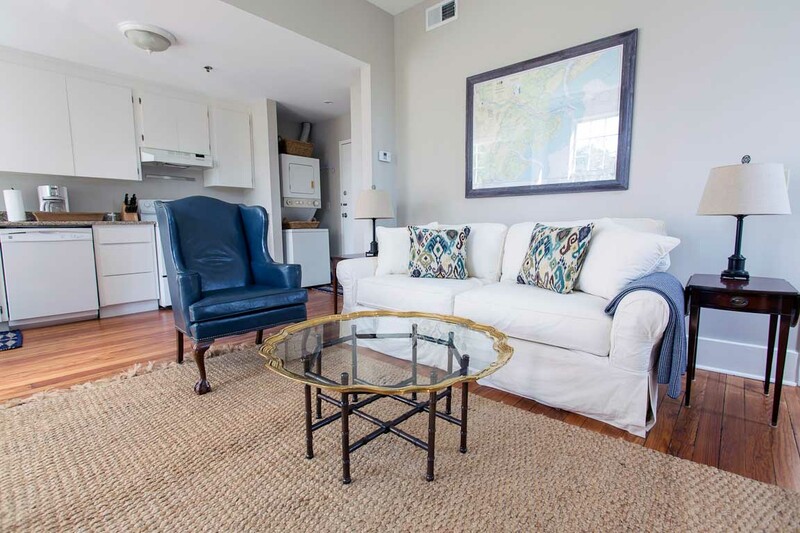 This was our second year in a row at Liberty Landing Too, a clean and comfortable apartment close to anything you would like to do in Savannah. The large windows allow you to soak in the sights and sounds (and the morning sun is glorious.) We intend to stay here again! Location is great. Convenient to restaurants, bars and tourists spots. Comfortable place and neat place. No real issues - WiFi a little slow and small TV but those things are reasons to get out and explore. Apartment is in a perfect location in the historic district and within walking distance to great restaurants, historical sites and shops. Very clean and all the amenities you will need. It is a 3 story walk up so you will need to be able to do stairs easily. My two friends and I rented this property for a girls' weekend. 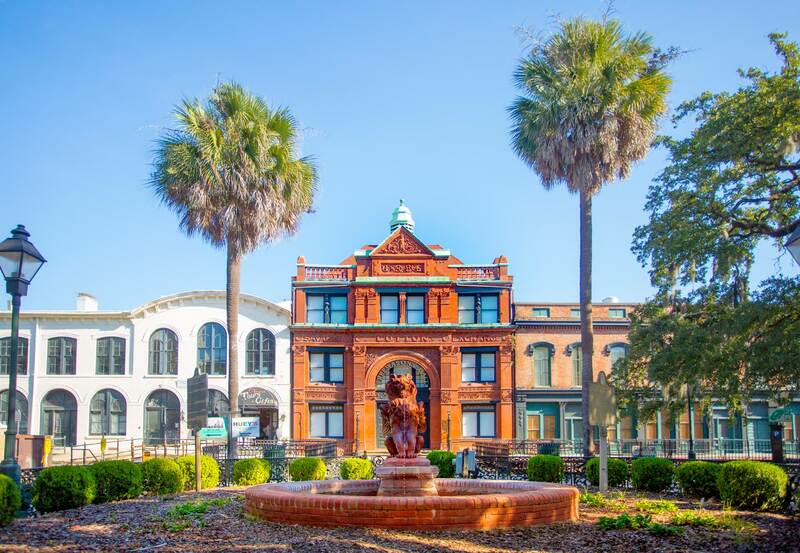 I'll start with the positives: The location is ideal--it is in the heart of the historic district and within easy walking distance of both the riverfront and Forsyth Park. It has a beautiful view of St. John the Baptist Cathedral. There are great restaurants within feet of the property (Hitch was our favorite.). We loved that we didn't have to check in at an office or with a person and keyless entry meant not having to carry around a key. Things that should be improved: The kitchen is minimally outfitted; there wasn't even a potholder. While the property is beautiful, it needs a thorough deep cleaning and freshening of throw pillows, etc. Two lightbulbs were burned out. The king size bed is comfortable, but the pull out couch is terrible. There is one mirror in the whole place which makes three people getting ready tricky. (We did finally find a full-length mirror buried in the back of the closet.) There is no iron. There is only overhead lighting in the living room; some lamps would be lovely. While the positives of the property are great, the negatives seem silly for the price and would make me hesitant to recommend the property when there are many others available. Some freshening, deep cleaning, and attention to detail could make this a great property. We loved this rental. The location was great, walking distance from almost everything we did. It was filled with sunlight. It was spotless when we arrived. We would definitely stay again. If you have trouble with steps, sadly this would not work for you. It is on the third floor. The view of the church was just amazing. The only small downside is the bathroom is small. Loved it. Amazing location! Central to all of historic district, walk everywhere! The apartment is very clean, spacious and bright. Everything we could've asked for. Amy, thank you for choosing Lucky Savannah! We're so glad you enjoyed the cleanliness, location, and spaciousness of your rental. We hope to see you again soon! It was very nice; we were impressed with the cleanliness. Hi Kathleen! Thank you for choosing Lucky Savannah! We always aim to impress. Thank you for letting us know that we succeeded. We hope to host you again soon! We loved everything about the place. The location, the layout, furniture, cleanliness. Great place to stay and would stay there again in the future. One thing that would have made our trip even more enjoyable would have been some flexibility around check-in and check-out times. Our travel schedule had us arriving early on our check-in day and leaving late on our check out day, so we were stuck driving around with our stuff when it would have been more desirable to relax at the rental. Perfect rental for my family of three! Great location. Very clean. Beautiful view. Hi April! Thank you for staying with us at Lucky Savannah. We're so glad we could provide you with a rental that was perfect for your family. We hope to see you again soon! Comfortable, spacious and a great location! We really enjoyed our weekend stay at this property! It's nicely appointed, and has a spacious living area in addition to the bedroom. It's also a walkable distance to downtown restaurants, bars and shops. The only two negatives to keep in mind are that the property is on the third floor (no elevator), and there isn't parking provided with the unit. Neither of these bothered us, and we would definitely stay here again! We had a girls weekend in Savannah and spent the weekend here. 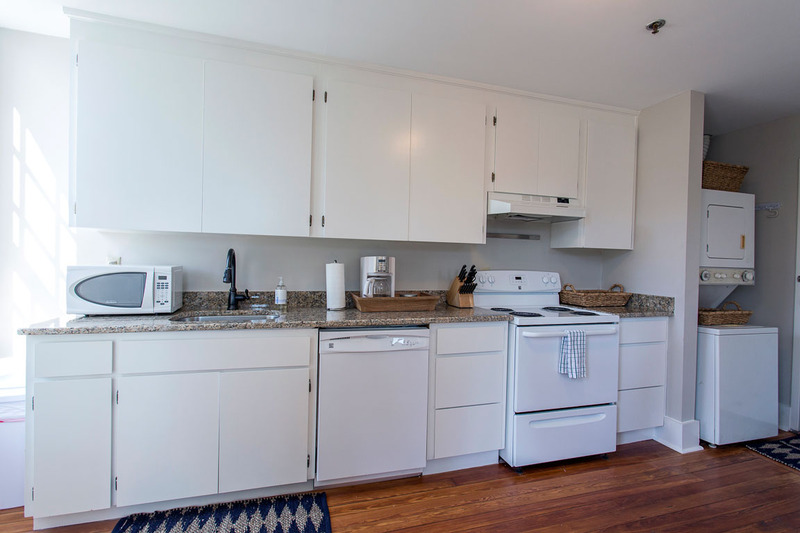 It is a spacious one-bedroom and we love having a kitchen and living space. Great view and natural light. It is close to so many different attractions and restaurants and squares. We loved our beautiful apartment home during our stay. The online pictures do not disappoint. It was open and bright. We never used the lights during the day! The bed was like sleeping on clouds. The kitchen was equipped with everything we needed, even wine glasses for the wine we got from Smith Brothers Butcher. The 3 flights of stairs did give us a workout, but we were walking everywhere anyway, so they did not bother us. (If you have trouble with stairs, I would steer away from renting this unit). The metered parking on Liberty & Abercorn was easy to get. And, as soon as we got into town we went to the visitors center for a paid parking pass so we would not have to worry about feeding the meters. We would definitely consider this unit again and have already recommended it to friends who are planning visits! Thank you Lucky Savannah for making this truly feel like our home away from home! Thank you again for staying with us, Maribeth! 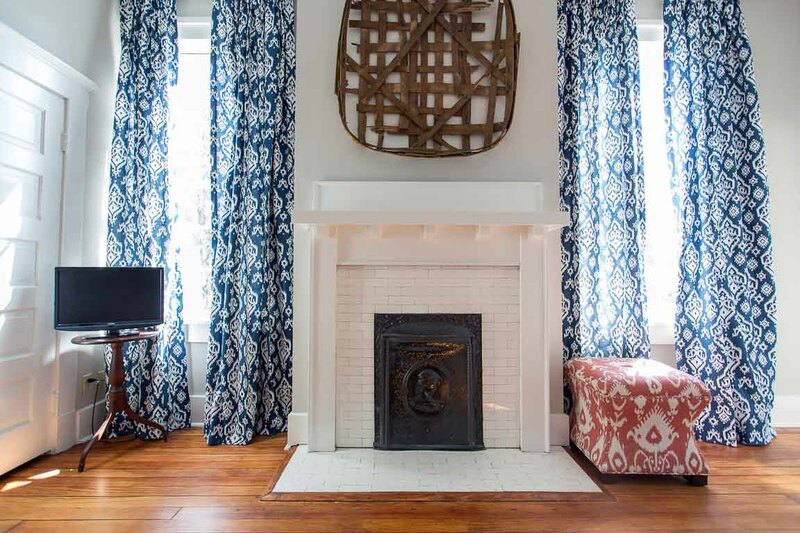 We're so happy to hear that Liberty Landing Too was the perfect addition to your Savannah stay. We look forward to hosting you again soon! Cute Apartment with a Great View! Loved this apartment! It was so cute and clean and the view of the church was amazing. It is in a great location within walking distance to all the major sites. Having the restaurant right next door was perfect for our lazy Saturday. Hi Alexandria! Thanks again for choosing to stay at Liberty Landing Too. We're so glad to hear that you enjoyed the location and took advantage of the downtown food scene. See you again soon! Hi Cynthia! Thanks again for booking with Lucky Savannah Vacation Rentals. We're so glad to hear that you enjoyed your time at Liberty Landing Too, and look forward to hosting you again soon. We had a very nice stay at Liberty Landing Too. It was well-appointed, nicely decorated, and in a great location. If we come back to Savannah we will definitely consider staying here again! Thanks again for choosing Lucky Savannah, Neale! Looking forward to hosting you again at Liberty Landing Too. The rental was very close to all of the wonderful things to do in Savannah. There are many restaurants (casual and fine dining) within walking distance. We did not have any problems finding street parking very close to the rental. We did find the bathroom to be quite small, especially the tiny shower. And after a few days the three flights of stairs were tiring, but that was just from long days of walking around town. Overall we had a great experience and would stay here again in the future. Lindsey, thank you again for choosing Lucky Savannah! We're so happy to hear that you enjoyed your time at Liberty Landing Too, and look forward to hosting you again soon! Beautiful apartment in a perfect location! Loved this apartment! We stayed for 3 nights while moving our son to SCAD and this was the perfect location close to everything in Historic Savannah. The apartment is very clean, and charming and has an amazing view of the beautiful church across the street and the bed is so comfortable! I would highly recommend staying here. Thanks for choosing to book with Lucky Savannah, Vanessa! 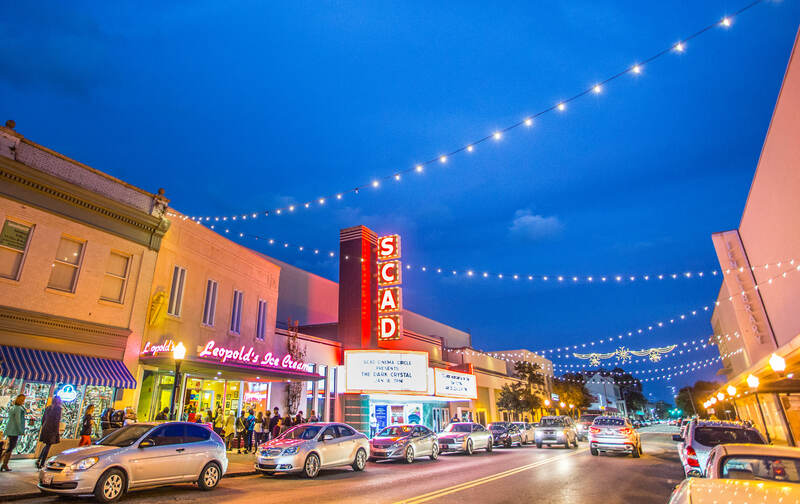 We look forward to hosting you again as you visit your son at SCAD. Maria, thank you again for booking with Lucky Savannah! We're so glad to hear that you enjoyed the location and charm of Liberty Landing Too and look forward to hosting you again soon. Wonderful place! Nice size, clean, bright and airy. Excellent view of the cathedral and well within walking distance for all destinations. Note: Is on the third floor so porting bags to this floor may be an issue for some. Otherwise great place. Tip- take advantage of the shopping service. Grocery goods can be available when you arrive. Colin, thanks again for choosing Lucky Savannah! We're so happy to hear that you enjoyed your stay and look forward to hosting you again soon. The rental property is as nice as the pictures. Great location - we were able to walk almost everywhere in Savannah. 1. The property is on the third floor. You will need to be able to tote your suitcases, etc. 2. Parking is metered all around the rental and Savannah has recently extended the daily times the meters are enforced as well as including Saturdays. Have plans for parking! 3. We were there on a weekend and Friday night foot traffic was very drunk and noisy. Saturday was fine, so hopefully not a frequent problem. We just made our 13th annual spring/St. Patrick’s day visit to Savannah and this property made it all the better!! 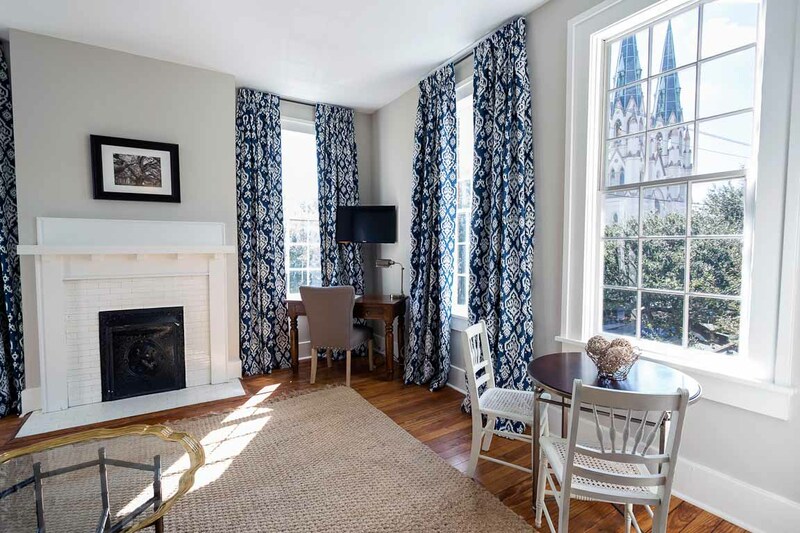 Wonderful stay at the Liberty Too, nestled in between a lovely breakfast:lunch spot and across from the most beautiful cathedral in Savannah z comfortable linens, great for two people. We walked to everything and can’t wait to visit again! Thank you for choosing Lucky Savannah, Tracy! We look forward to hosting you again soon. The room was beautiful and looks exactly as described and shown in the photos. It was a little tricky to find parking close to the entrance but we were able to find metered parking a short walk down the road. The rental is located on the third floor and there is no elevator so I wouldn't recommend it to anyone that may have trouble walking a lot or going up and down three flights of stairs throughout your trip. Otherwise, it had a beautiful view overlooking the cathedral and was less than a 15-minute walk from the main shopping and dining areas. Thank you again for choosing Lucky Savannah, Margo! We look forward to hosting you again soon. We had a wonderful experience this weekend. The apartment was bright and airy and the location was awesome. We rented this apartment for a week. It was beautiful with lots of natural light. The view of the cathedral was spectacular. The location is perfect and we were able to walk pretty much everywhere. Management was very responsive. The microwave wasn’t working properly and they replaced it within hours (yay)! The only issue we had was that the curtains, fan and underneath the bed were pretty dusty and my daughter and I kept having bad allergies. Other than that it was a perfect stay. Lydia, thank you for choosing Lucky Savannah! We are so glad that you were impressed with your rental's location and our team's responsiveness! Thank you for alerting us of the issues you encountered as it allows for us to offer you the best stay and accommodations possible. We hope to see you again soon! The rental was awesome, right in the middle of everything. The third floor walk up was challenging after walking around all day. Parking was also challenging, however, we never took the car out after leaving it in a nearby garage. We had no problems at all during our stay and would stay there again. Rental was clean and well kept. We stayed in Savannah for ten days and wanted to have a place that felt more like a guest house than a hotel. This was perfect: great location-- just a couple of blocks off Bull street so the it was quieter. Yet is was located near several restaurants, a wine bar, the beer growler, Byrd's cookie shop and a gourmet market open 24x7. The location was also right along several bus and trolley stops. The living/dining area has a spectacular view of St. John's the Baptist Cathedral, especially lovely at night. The staff was very helpful and friendly. We stayed on the third floor which does have stairs to climb, however there is also a second floor unit with less stairs. The apartment/loft was clean, well designed/decorated and contained a well stocked kitchen (dishes, pots/pans/utensils, etc.) with plenty of towels and dishwasher/ laundry soap. Would recommend adding some more hangers as there were only two in the closet when we were there. I highly recommend this location. We had a great time and look forward to our next visit! Great Rental and Very Clean! The condo looked exactly as pictured! Before renting we weren't aware that this condo was on the 3rd floor and that the place had no elevator, but this wasn't a huge deal. We thought that it would have been a little closer of a walk to River St. like described since we parked our car and never moved it, but walking through the parks every day and night ended up being worth the walk! It did take us about 15 minutes to walk to City Market and River St. We ate at J. Christopher's which is right downstairs and it was a great breakfast place, and you can't beat a restaurant that close! The beds were very comfortable (including the pull out couch)! Would recommend staying here! This unit is wonderful! Clean, airy and beautiful. This unit is on the third floor and the last flight of stairs are narrow. Keep this in mind for any luggage you bring. This location is within walking distance of everything. If I get the chance to visit Savannah again, I would use Lucky Savannah for accommodations. This was a great place to stay. It was convenient and walkable to many locations and tourist sights.the full kitchen, equipped with washer/dryer was handy. We were 20 minutes away from Tybee island, so being able to wash beach clothes were awesome. The staff were professional, let us check in 30 minutes earlier upon arrival. We enjoyed our stay! The kids enjoyed it as well. We love staying at this location. It's a perfect fit for us since we can easily leave our bikes in the entrance hallway. The rooms are always very clean well maintained. Great Location & Very Charming! Highly Recommend! My husband & I drove up to Savannah for a weekend trip to celebrate our Anniversary. It was a last minute trip. The people at Lucky Savannah were extremely helpful. They recommended local places to try including tours, restaurants, etc. I had narrowed down my choices to two of their rentals & asked which one they would recommend given what we were going for (sightseeing & eating) & they recommended this one based on the central location. They couldn't have been more right! It is very centrally located to everything. We walked to everything all weekend long. Literally parked the car & didn't drive again until it was time to leave. Parking was a non-issue. While it is on-street, it ended up being fine. We had to circle the block a few times but ended up finding a spot that we could see from the bedroom window & since it was the weekend, we didn't have to pay for metered parking. There is a trolley stop right around the corner so in the event it ends up raining, this ends up being very helpful. The condo itself is absolutely adorable. The bed was very comfortable, the decor was very cute, it was clean & well stocked. It has great views of the town out of all the windows. It was just the two of us but you could easily fit four people if you made use of the couch bed. We do plan on going back to bring our kids & plan on staying here again. The price was great too. I had searched everywhere in Savannah & couldn't find anything nearly as nice as this for the price, or really at all. The internet worked good & so did the two TVs (we ended up watching movies one afternoon while it rained). Lucky Savannah even left us a note with a bottle of wine & some goodies for our Anniversary! This is a great little place to stay & I would highly recommend it to anyone looking to visit Savannah! And if this one is booked, I would still highly recommend booking another rental with Lucky Savannah as they were more than great to deal with. This apartment is extremely charming. Clean and well furnished. The view of the church at night all lit up was enchanting. The bed was so comfortable. Loved this place. Liberty Landing Too is on the 3rd floor of a recently renovated building containing 5 vacation rental apartments all managed by Lucky Savannah. This unit faces both Liberty and Abercorn Streets so the views are wonderful. It's bright and sunny and far enough above the street so that street noise is not a problem. However, it's up two significant flights of stairs. My wife and I stayed for two weeks with our dogs and enjoyed every minute of it. If you don't have pets, there are other units that Lucky manages that are better equipped. We even cooked in most nights after eating out for lunch. The kitchen was adequately equipped although you will want to bring your own spices, olive oil, etc. or plan to buy them at the local Kroger if you're going to cook. The unit was clean and functionally laid out. The Lucky staff was very helpful supplying extra laundry detergent, dishwasher soap and handling minor maintenance issues. The wifi signal was very week until we changed to the other network in the building (both managed by Lucky and have the same password). The other units turned over multiple times during our two week stay; the other guests were friendly and we never heard them when we were in our unit. The technology Lucky uses allows you to lock/unlock the door and manage the heat/AC remotely using their phone ap. Thank you for choosing to stay with Lucky Savannah! We are so glad you found the views from the apartment to be wonderful. This building is very sound and quiet, making those nights at home very relaxing. We are thrilled to hear you all enjoyed your stay! We hope to have you all as our guests again in the near future. Please don't forget about our 10% "Returning Guest" discount! It was a delightful experience and the Lucky Savannah group was wonderful to work with in preparation of our trip and while on site. Love the app. It was very helpful. Thank you for staying with Lucky Savannah! We are so glad to hear you enjoyed your stay, and all your questions were answered within a timely manner! We are also thrilled to hear the app was very helpful! 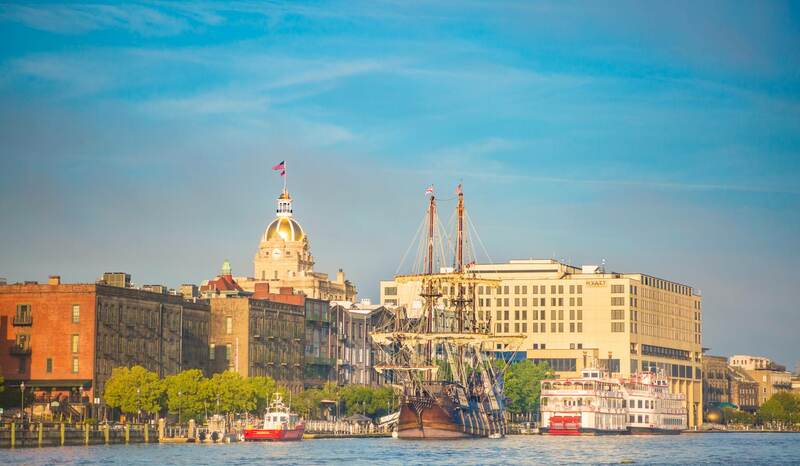 We hope you decide to travel to Savannah again, in the near future! My sister and I stayed here for the Rock and Roll Marathon. We were very impressed with the rental and would stay again. The location is more than perfect. Half mile from the river, right on the middle of all the action. If I had to change anything to make this a "dream" property, I'd get a firmer bed (you could tell there was a nice pillow top on it but it was one of those beds you sink into and as a stomach sleeper, it was a little squishy) and I'd have some sort of filter put on the tap water. I'm sure it's just how the city water is but a filter might help (kind of a chlorine taste). Otherwise, I would highly recommend this property! Thank you for choosing Liberty Landing Too for your Savannah vacation! We are so glad you chose to stay with us for the Rock'n'Roll marathon. We thank you for the kind review. We are so happy to hear you enjoyed your stay! We hope to have you as our guests again, very soon. We really enjoyed our stay. The room has a beautiful view of St. John the Baptist, and is in a great location. This was our first trip with our dog, and I believe she thoroughly enjoyed it too! Be forewarned though, it is a 3rd floor room, and there are a lot of stairs to climb! Thank you for choosing to stay with Lucky Savannah! We are so glad to hear you all enjoyed Liberty Landing Too. This home offers a great location, with a perfect view of the cathedral! We hope you all return to Lucky Savannah next time your in town. We arrived very late in the evening, and due to the app and keyless entry, finding the place and getting in is a breeze! The apartment is spotless, very clean and VERY comfy bed. Be careful if you're driving, parking is an absolute nightmare in Savannah and you may end up parking quite a ways away! Thank you for choosing to stay with Lucky Savannah! The keyless entry makes everything so much easier, even when arriving at night! We are so glad the apartment was spotless for you all, and you all enjoyed the bed. Parking can be tricky sometimes here in Savannah, we do sincerely apologize! Thank you for choosing to stay with Lucky Savannah! Liberty Landing Too is a fantastic place to stay, as it is centrally located in the heart of the historic district. We are so glad to hear you enjoyed your stay at this home! We hope to host you all again. I chose this location because of it's central location. You can park your car for the weekend and walk to the different sites. The rental was even more beautiful in person with a large living space and kitchen. Check-in and check-out were easy thanks to the Lucky Savannah app. We can't wait to return to Savannah and stay with Lucky Savannah Rentals again. Thanks for a great stay! Thank you for choosing to stay with Lucky Savannah! We are so glad you found the location to be great and convenient. 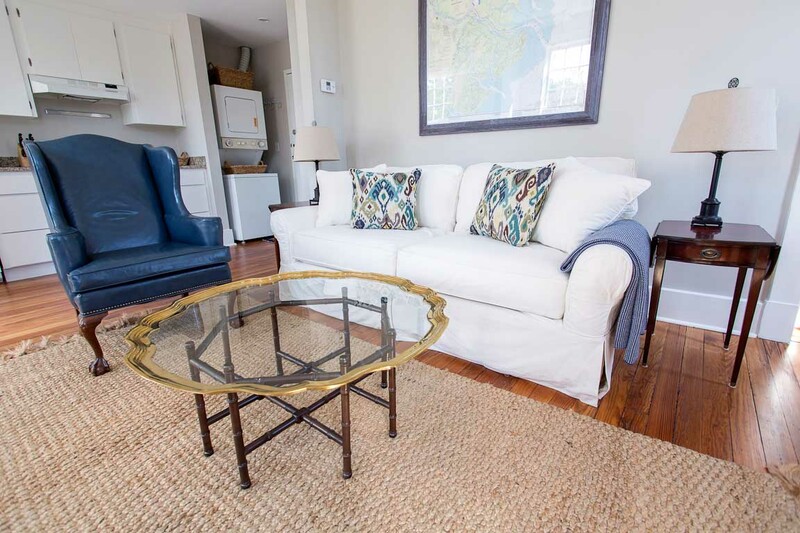 Liberty Landing Too is a great place to stay and offers fine furnishings! We are thrilled you all had a great stay and can't wait for your return. My wife and I stayed in this cute little apartment in the middle of Savannah's historic district in late April/early May 2016. Adorable, clean unit with a safe feel to it, the A/C worked great which is a nice break from the heat/humidity, and there is keyless (#code entry). Upon arrival, we couldn't access the unit using the code we were given, but we called Lucky Savannah (after business hours) and someone answered and immediately helped us get a new code. That was the only "blip" and they handled it perfectly. There's street parking (meters) nearby that fill up quickly, but from 6pm friday - 8am monday morning it's free. Centrally located, it's a great location to walk all over town, so that plus the keyless entry was a great feeling not needing to carry keys everywhere we went. It's about a half mile to bay and river streets, but it's a really easy, relaxing stroll with beautiful oak trees shading parts your path, and little town squares (basically tiny parks) with benches every few blocks that are very charming and nice to relax in. The unit is on the 3rd floor and there is no elevator, so FYI its a good brief workout to get a suitcase up/down the stairs. Great view of the beautiful catholic church across the street. There's free wifi, a washer/dryer with 1 complimentary detergent, frige/freezer and some plates and kitchen utensils if you need them. Comfortable bed as well. We loved it- it was like our little home away from home in savannah and would definitely stay again, as well as recommend to friends and family. Makes you feel kinda like your living there for a brief time, not just visiting. Thank you for choosing to stay with Lucky Savannah! We are ecstatic to hear you all had a great time at Liberty Landing Too. We apologize for the error with the electronic lock, but we're happy we could resolve that for you right away. This home is in a great location indeed! Many great attractions, restaurants and much more surround this home. We are happy you found the apartment to be your "home away from home"! We strive to provide excellent customer service and ensure a great stay. We're looking forward to having you all again. My daughter and I had a wonderful time right in the middle of historic Savannah. The location of this rental was great! This rental was beautiful and spacious and the bed was great. I would highly recommend this rental. Lovely place, great walking location, exactly as advertised. Would stay there again. We loved our vacation rental on Liberty street. Perfect place to stay and perfect location! Everything was great. I would recommend cleaning the ceiling fan in the bedroom and possibly adding 1 or 2 luggage stands. We had a great time in this rental. It was the perfect location to walk around. The decor was great and just the right amount of space. I appreciated the items being ready for us and we did not need to go out and buy them on arrival. Great little wine and beer spot beside of it. We ate at J Christopher's twice. It was convenient and delicious. The Public House was great as well. I will say it could have been a little cleaner. The bedspread had human hair and the couch under the pillows had dog hair. There were a couple of spill, sticky spots on the kitchen floor as well. The street is quite noisy at night, but we never heard any of the renters in the building. I also got a workout taking the dogs out three flights of stairs. I would say I enjoyed it, but definitely not on a regular basis. I would recommend this. Thank you for staying with Lucky Savannah! Liberty Landing is very convenient for all types of restaurants and shopping. We sincerly apologize that the home could have been cleaner upon your arrival. We thank you for bringing this to our attention, and will speak with our housekeeping department. We appreciate all of our guests inputs! A wonderful unit that is very clean and tastefully decorated. Liberty Landing Too is conveniently located within walking distance of all most all Savannah activites. Our son lives in Savannah and we would certainly stay here again on one of our visits. Bride getting ready location ! Super cute, clean and an awesome view! Numerous problems with entering apartment. Codes didn't work on two occasions. Finally had to have agent bring a key. That was really the only snag in the whole experience, but they were prompt in correcting the issue. Hi Julie! Thank you so much again for choosing to stay with us. We're so glad to hear you enjoyed Liberty Landing Too and that our staff was responsive to your requests. Please know you're privy to our Friends and Family discount next time you stay with us, and we look forward to hosting you again soon. We spent 4 days in the Liberty Landing Too and couldn't have been happier! Super clean, beautifully decorated (not cheesy!) and perfect location! We walked EVERYWHERE from here! We never even got in our vehicle once we hit town. 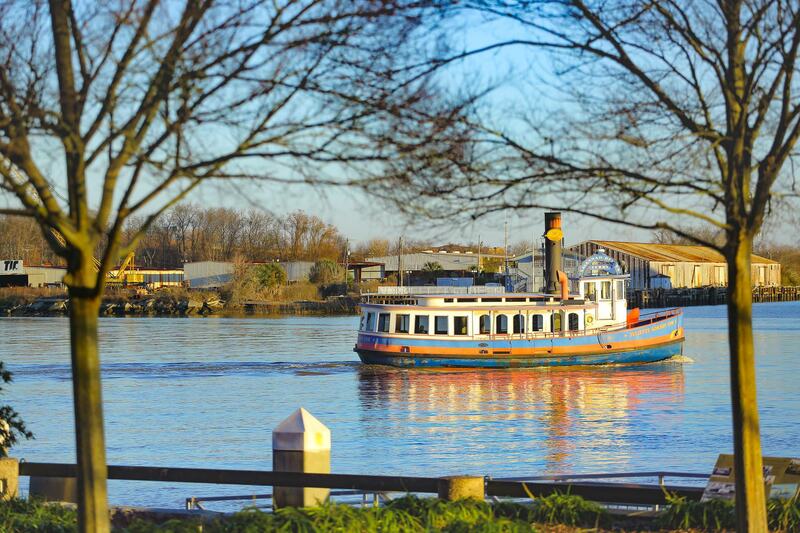 All the shopping and any restaurant you could dream of is within walking distance of this little gem! I would highly recommend staying here, and we will surely stay here again on our next visit! Hi Karen! Thank you so much again for choosing to stay with us. We're so glad to hear you enjoyed Liberty Landing Too and our beautiful city. Please know that you're privy to our Friends and Family discount next time you stay with us. Looking forward to hosting you again soon! The property was awesome! PERFECT location and the management company was always available. They accommodated my late check out, which I so appreciated....will definitely rent from them again and hope to get the same unit, don't think I'll stay anywhere else when I visit Savannah....THANK YOU! 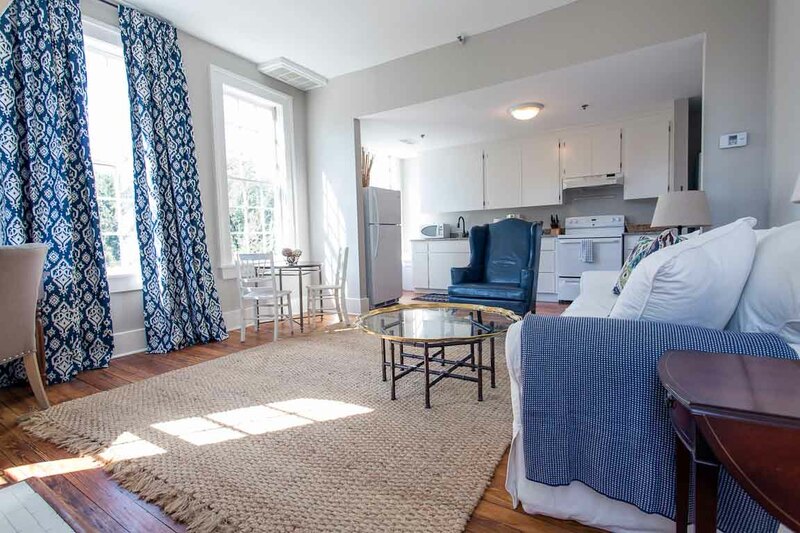 This 1 BR apartment is in a perfect location in the historic district. Nothing seemed more than a mile away. The view of the cathedral from the window is very nice. The apartment being pet friendly and just a couple blocks from a square for dogs was a great option for us instead of having to board, we were able to bring the other part of the family. Would definitely look to stay at this location again next time we're in Savannah. The management staff were amazing and so was our stay. The couch is a fold out so if you wanted to bring a little one you could and still have privacy from the bedroom but it is only one bathroom so I would say this is better for folks traveling without kids who want a nice romantic stay in Savannah. We went for our anniversary and it was perfect. Hi Mathew! Thank you so much again for choosing to stay with us. We're so glad to hear you enjoyed Liberty Landing Too for your anniversary trip. Please know that you're privy to our Friends and Family discount next time you stay with us. Looking forward to hosting you again soon! Hi Marge! Thanks again for staying with us! I really love this rental, however it was not as nice as the first time I stayed here. The unit was a little more run down and a little more dirty. Also, there was an odd noise coming from the duct work on the last night of our stay. It was a rumble that went from quiet to loud the entire night, into the next morning. It impaired our sleep that evening. Hi Heather! Thank you for returning to Lucky Savannah. We do apologize if this trip did not meet your expectations, and will absolutely pass along your feedback to housekeeping and maintenance. We hope you'll allow us the opportunity to impress next time you're in town! Wonderful unit located across from the Cathedral and one block from the K of C. Very clean, appointed and professionally managed. Hi Mark! Thanks so much for staying at Liberty Landing Too. We look forward to hosting you again soon! Excellent location with everything within walking distance, but there is a lot of street noise to be heard from within. A great breakfast place is right next door. The apartment is very comfortable, cute and well appointed, The carpet on the stairway up is very stained and doesn't lend itself to a good first impression, and there is quite a thick ayer of dust on the bathroom light and ceiling fan blades. But we loved our stay regardless. Hi Marti! Thank you for staying at Liberty Landing Too. We're happy to hear that the apartment is comfortable and that you enjoyed your breakfast next door! We will absolutely forward along your feedback. Beautiful flat and very accomodating! Excellent location for the historical district. Thank you for the kind words, David! Lovely apartment in great location. Hope to return. Fabulous trip to beautiful Savannah. This apartment was beautifully decorated and very comfortable. A great location as well! I would highly recommend. Excellent! Love Lucky Savannah team and properties, having stayed with them multiple times. My sister and I came here for a long weekend, and couldn't have been happier with our choice in lodging. Excellent location away from the noise of Broughton St. But an easy walk to any of our destinations. Joy at the mgmt conpany stopped by, and was very kind and helpful. We would come back here in the future. Thank you Lucky Savannah! We thoroughly enjoyed staying at Liberty Landing Too. The location was awesome, and the condo itself was very nice. I would definitely stay here again. Lucky Savannah was great to work with and took care of everything, including providing a pack and play for our daughter. Super location, parking turned out to be no problem, with lots of it back along Liberty St where there are no meters, and the stairs up to the place are no big deal. Kitchen was well equipped (although it should have a strainer for pasta). Bedroom was great (although some coat hangers would be handy). The living room had super views of leafy foliage and the cathedral. We loved our stay. We'll Definitely Be Coming Back! Perfect location, amazing view of the oldest Catholic church in Georgia, could walk to everything, clean, well-stocked, and homey. Next time we visit Savannah, we hope to stay at liberty landing too! I absolutely loved staying at Liberty Landing too! The location in Savannah is perfect, almost exactly in the middle of the historic district. The apartment was spacious, clean and bright. Check in and check out was a breeze. I am staying with Lucky Savannah again in april and look forward to another lovely rental property experience. Savannah is beautiful place and our stay here was everything I hoped it would be. Our rental at Liberty Landing was perfect. This is the best location to everything and the view of St. John the Baptist Church from our window was glorious. I will stay here again the next time. Great place for a weekend getaway. Location was within walking distance to everything we wanted to visit. I was a little concerned about parking but with a visitor's day pass we had no trouble finding a meter spot. We will definitely be coming back to Savannah and booking with Lucky Savannah Rentals! We had such a lovely time when there over Memorial Day. The apartment was adorable! It had so much sunshine and really high ceilings and windows that it felt very light and airy. The bed was very comfortable and the location was perfect. Right next door is a fabulous brunch place too! We couldn't have picked a better spot for our weekend away and Lucky Savannah was incredibly accommodating and helpful every step of the way.